Spike nature’s healthiest replenisher with a sprig of fresh herbs and juicy fruit! Stay hydrated with these four herbal infusions that will motivate you to drink more water. Many health practitioners state that adding more H20 to your diet is great for your body. Studies have shown it can increase brain power, flush out toxins and even boost the immune system. However, let’s be honest… plain old water can use some extra pizazz. Right? 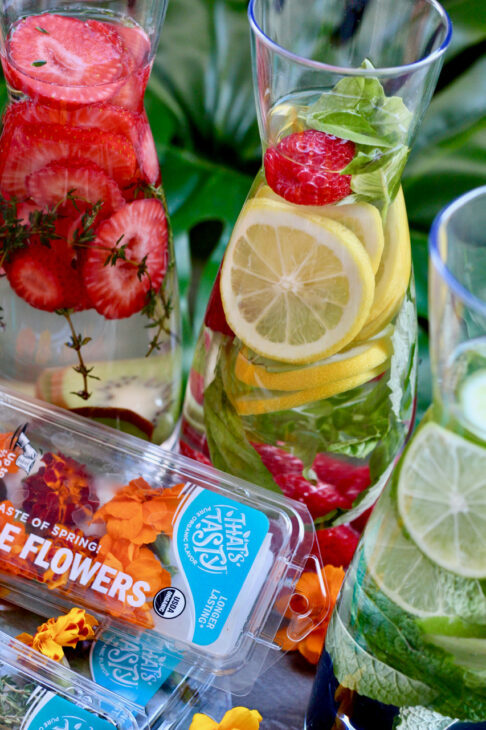 Here are a few mixes to keep yourself deliciously hydrated. Blackberry: Rich in anthocyanins, a powerful antioxidant that gives them their deep purple color. Mint: Anti-inflammatory that has immune-boosting benefits. Lime: A natural detoxifier that is rich in vitamins and minerals. Rosemary: Good source of iron and boosts circulatory system. Grapefruit: Helps regulate blood pressure and promotes heart health. Raspberry: Bursting with antioxidants and high in fiber. Basil: Anti-inflammatory that’s a good source of magnesium. Lemon: Aids bloating and fluid retention. Strawberry: A great source of fiber, manganese and potassium; boosts immunity. Kiwi: Rich in Vitamin C, folate and potassium. Thyme: Good source of Vitamin A, copper, fiber and iron. Want to get fancy? 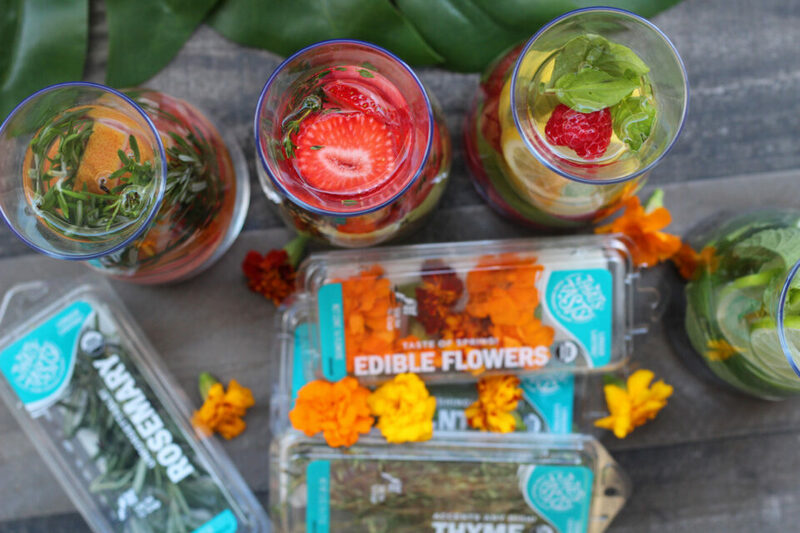 Garnish your cup with our edible flowers! It’s a new year, so there’s no better time to refresh the new you. Did you know that adding more water to your diet can aid in weight management? Summer bodies are made in the winter… so drink up! 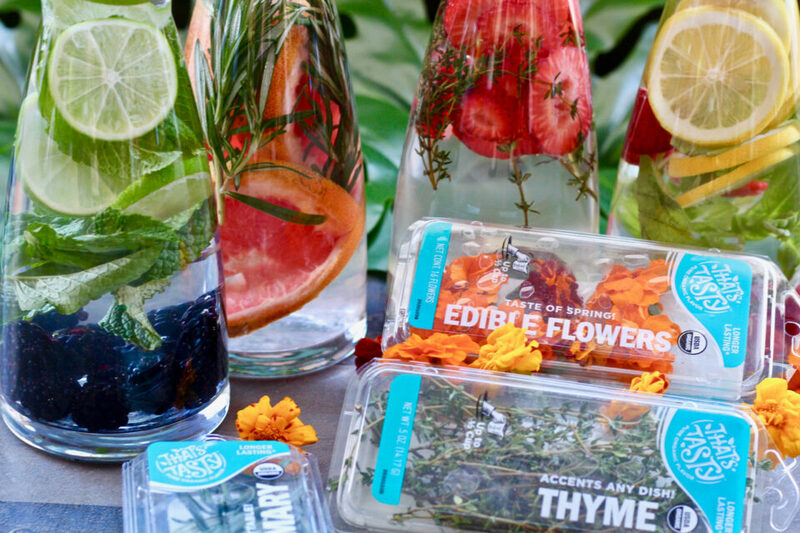 Making infused water couldn’t be easier. There’s no exact recipe here, simply add as much fresh herbs and sweet fruit as your little heart desires. Grab your favorite pitcher and fill it with fresh water. Then add some flavor enhancers from our list above. Voila, you’re all done! To maximize flavor, place your infused water in the fridge for at least an hour after adding herbs and fruit. This allows everything to mingle a bit. If you’re in a hurry, slightly smash fruit before adding to the pitcher. This adds instant flavor that you can enjoy right away. When adding leafy herbs like mint and basil, make sure to slap them against the palm of your hand to awaken their scent and flavor.